Cable is the medium through which all you digital signaling information moves from one network device to another. Several types of cable are commonly used with LANs (Local Area Network). Very often, a network utilizes only one type of cable, whereas other networks will use a variety of cable types. The type chosen for a specific network is related to the network’s topology, protocol, and it’s size. The placement of your cabling, certainly in a enterprise situation, provides ease of wire management for troubleshooting and replacement of cables. Our Cisco and Comptia Network engineers will make sure that your cabling infrastructure is out of visual site and reduce all the clutter in the server room and the patch panels. We will also take care of getting rid of all your dangling cables behind all your work desktops and any trip wires that might present health and safety issues as well as a security risks. 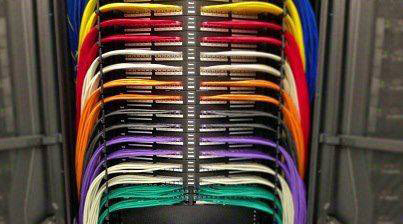 Ethernet cables or fibers, are a nightmare if they aren’t carefully organized, not only because they look bad, but also they are not easily managed. We consider the cable management of great importance and absolute necessity. You, as our client will receive an efficient cable management solution with adequate documentation for future troubleshooting and for better maintenance or further extension. Whether you require a whole new installation or just an extension, for your new or old offices space, we can arrange commissioning of the entire cabling prior to your office move via our Office Moves partners.